If the skin at the hand is too thick and hard, it will be more difficult for medication to penetrate deeply enough to improve the skin inflammation. This increases the likelihood of untreated and persistent hand eczema. Another reason why hand eczema does not go away could be the continued exposure to an irritant which has yet to be identified. Patch testing is then recommended. 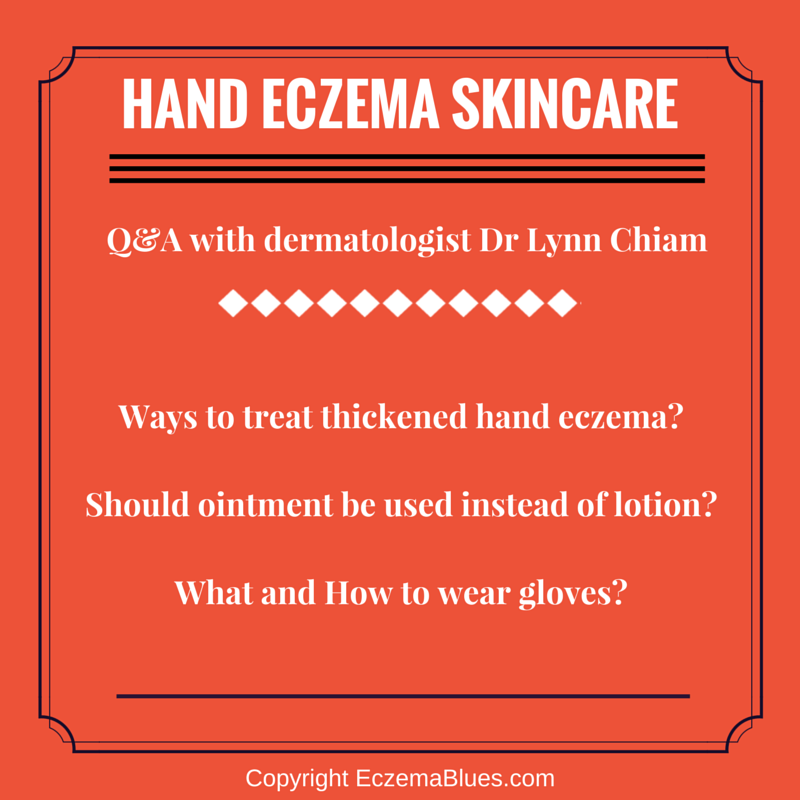 MarcieMom: Dr Lynn, what are the ways to treat hand eczema when the skin has thickened? Dr Lynn: For thickened skin, topical steroids of higher potency should be used. Ointment based steroids can be used instead of cream based steroids. Liberal and regular use of moisturizers should be emphasized. The use of wet wraps (occluding the creams with a wet glove) can also help to increase the penetration of the creams across the thickened skin. Phototherpy (controlled use of UVA or UVB light) is sometimes used in this type of hand eczema. MarcieMom: How often do you see in your practice that patients cannot recover due to continued exposure to allergens in their moisturizers or topical medication? When should one suspect that is the case and request for a patch test? Dr Lynn: Allergy to topical medication and moisturizers are extremely rare. If patient had avoided all other possible irritants or allergens and have been compliant with medication and not getting better but worse, then the unlikely possibility of allergy to medication/ moisturizer can be considered and a patch test performed. MarcieMom: Dr Lynn, for those with hand eczema, should they be using an ointment instead of a lotion so that more of the moisturizer can be retained even with hand washing? Also, an ointment will be more protective against irritants. Dr Lynn: Generally, ointment tend to be better absorbed and lock in the moisturizer for a longer period as compared to lotions. By repairing the skin barrier function faster than lotion, they tend to protect the skin and allow the skin to heal faster. They generally contain fewer preservatives and additives than creams. MarcieMom: For occupations such as caterers, hair dressers, nurses and mechanics, will wearing gloves during their jobs help to reduce contact dermatitis? If yes, what type of gloves should they wear? (I read some recommendations for vinyl gloves while others recommend cotton-lined gloves. Avoid latex gloves.) Are there any guidance on how long one should wear glove (since that trap sweat which is a possible irritant)? Dr Lynn: Yes, wearing gloves is recommended for those in certain occupations where contact with certain irritants is repeated and prolonged. I will generally recommend cotton gloves as they generally do not cause irritation. However, if contact with water is necessary, use a water- proof gloves. If wearing latex gloves makes the rash worse, a patch test can be done to determine latex allergy. Glove choice should be appropriate to the situation. Alternative to latex gloves include vinyl, nitrile and chloroprene. However, some of the chemicals used in the manufacture of non-latex gloves can also cause hypersensitivity. I will advise patients to remove the gloves after about 20 minutes to allow sweat to evaporate. Dry the gloves inside out when not in use. Thank you Dr Lynn for sharing with us skincare for hand eczema and understanding possible reasons why hand eczema is persistent. Hand eczema affects many adults and learning more about it help to manage the rash better.